Why Focus on Hand and Finger Safety? Before getting to “the how” of effective hand and finger safety training, let’s discuss “the why.” Hand and finger injuries are among the most common workplace injuries. Workers too frequently suffer lacerations, pinches, punctures, and smashes from tool or machine malfunctions. Healthy hands and fingers are critical to perform most jobs, so accidents involving these body parts can easily become lost time injuries or permanent disabilities. Serious injuries are particularly concerning because hands and fingers are difficult to repair and rehab. They are complex body parts designed to perform fine, intricate movements. On the bright side, these injuries are largely preventable. A good safety knife—that is, with a finger-friendly® blade—and acute hand and finger injury awareness can greatly improve your workplace safety record. 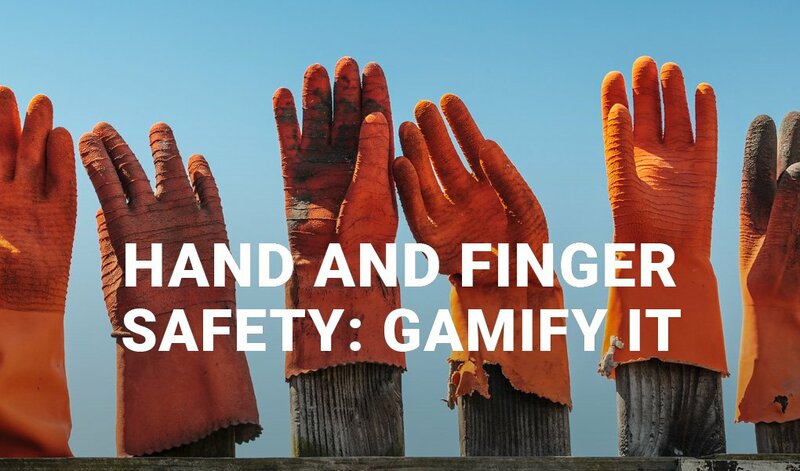 You may wonder if by gamifying your approach to hand and finger safety in the workplace, workers won’t take it seriously. Games are for kids. They’re for leisure and play, and safety is not a playing matter. Shake the notion that gamification and games are the same thing. “Gamification is the craft of deriving all the fun and engaging elements found in games and applying them to real-world or productive activities,” states gamification pioneer Yu-kai Chou. Apps like Duolingo, Geography Drive USA, Memrise, Udemy, and TED-Ed, to name a few, all employ gaming strategies to inspire learning. Hackathons use the game tactics of competition and big rewards to inspire innovative thought over intense work periods. The CrossFit workout craze integrates competition and leaderboards into their program to inspire people reach their fitness potential. To explain why gamification works, Chou differentiates between human-based design and function-focused design. He identifies the former as “a design process that optimizes for human motivation in a system.” Gamification is an inherently human-based process. A function-focused approach, which is how workflow is traditionally designed, optimizes “pure efficiency.” Think of a standard factory floor or assembly line. Viewed through the lens of teaching, as during hand and finger safety training, if you’re using the function-focused approach, it’s about shoving large amounts of data at a person, as quickly as possible. That means, for example, day-long safety seminars, books, handouts, or lengthy PowerPoint presentations. Cue the boredom, overconsumption of coffee, waning attention—and that glazed-over look. Many people associate gamification with video games and with younger generations like millennials and Gen Z. Those associations aren’t wrong, but they don’t tell the whole story. Consider Chou’s core drives: these are drives that all humans share. And games have been around a lot longer than the Internet; they’re an effective way to bridge the generation gap. While you can employ digital technology to gamify your safety training, it’s not a must. Gamifying your hand and safety training in the workplace is easy: incorporate game strategies to your process. You don’t even need to let on that you’re trying a new safety training technique. This is why astronauts spend inordinate amounts of time running emergency scenarios. It’s why we do fire drills. It’s why the Resusci Annie doll was created for CPR training. It’s why pilots do simulation flights that look like, yep, video games. Your gamified “learn by practicing” training can be a simulation or it can be integrated into the regular work day. Say you want to focus on three key hand and finger safety tips for a week: following PPE protocol, identifying and avoiding pinch points, and eliminating or avoiding smash hazards. Present your tips and challenge in a short safety moment, and divide your workforce into teams. Define how workers can earn and lose points: lose five points for not wearing gloves; gain a point for identifying a pinch point but gain ten points if you stop someone else who’s in danger of getting pinched; gain five points if you fix a smash hazard and lose five if you create one; and so on. Points should reflect how much a behavior improves or threatens hand and finger safety in the workplace. Add points each day and post them on a leaderboard. Total the points at the end of the week to determine a winner. Treat the winning team to a predetermined prize. Your gamification efforts can be as simple or complex, long or short as you choose. Do you have a problem with workers being distracted by digital devices? Distractions are a leading cause of many types of injuries. A modified game of tag might be your solution. Establish screen-free zones in your workplace and get a volunteer to be “it” and wear the “it” waist bag (this “it” object could be anything that is visible and identifies who is “it”—a scarf, badge, rubber bracelet—but the bag works well because it’s a place to put a device when it’s not in use). These games encourage worker interactions around staying safe—safety is a team effort; safety protocol practice, and attentiveness. Being aware is the key to staying safe. And it involves friendly competition and rewards, which are fun. How will you gamify hand and finger safety?